Wesley, aged 37, from Tulsa, Oklahoma, graduated from the Professional Welder program at Tulsa Welding School in October 2015. 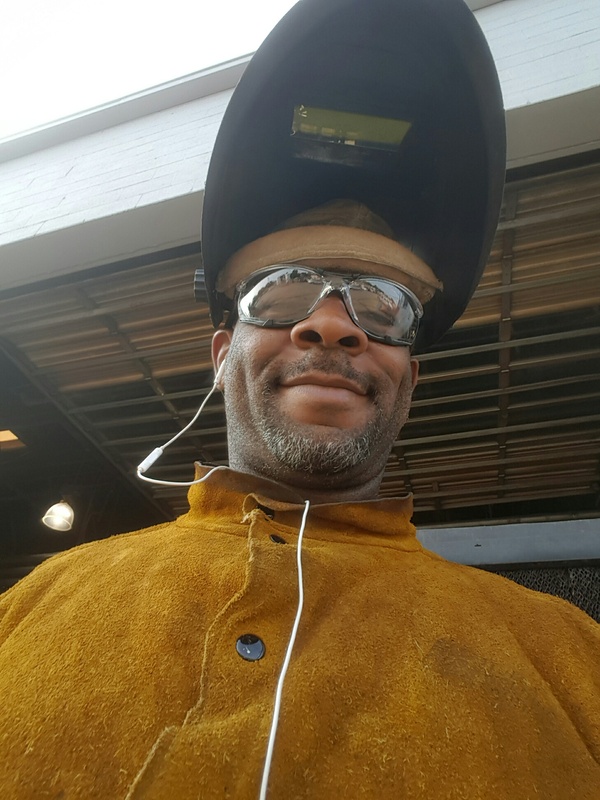 Wesley had never welded before, but it’s helped turn his life around. Thanks for your time Wesley; what made you go back to school for welding in your mid 30s? I’d really wanted to go to welding school since I was 21 years old, but I kept going back and forth to prison. When I was 25, I got sent to prison for ten years. So I really didn’t get the chance to go to welding school until I was 35. What made you choose welding? I’d always wanted to be a welder. I thought it looked cool! When I finally got up close and personal with it, when I learned how to do it, then that’s when I fell in love with it. So there were no family connections to welding? I’m the first welder in my family! Since I graduated my cousin called and told me he’s just started welding school in Texas. In fact it was the day after I won a welding machine. That’s when he told me he was going to welding school in Arlington. You won a welding machine? Wow! Tell me about that. It’s an Invertec V350PRO, a combo welder by Lincoln. I went to the school last Saturday (TWS National Open House) to do some brushing up and, they had a raffle contest going on. We put our names in a cup, and they pulled mine out! Congratulations, that’s very cool! What was the favorite part about the TWS program and why? I liked that I went in not knowing how to do something and came out knowing all the basics of welding seven months later. My favorite part was when we got into the TIG part of it. I like working TIG a lot. What is it about TIG that you enjoy? I get to use both of my hands. Using the MIG gun is fine, but TIG…I don’t know why. It’s just something about getting both your hands going at the same time in two different directions – I like that. Did you feel like you were on your way to becoming a professional when you left TWS? They taught me the basics of what I needed to know to get real serious about welding. I’m learning a lot from the dudes I’m working around. Some guys have been doing this for 15/20/25 years. If I’d not gone to welding school, I wouldn’t understand the stuff that I’m learning from them. Some people say you can pick welding up on the job, but you need a basis to build on. You can’t learn surgery from just being in a room with a doctor. You can see it being done, but that doesn’t mean you know how to do it. 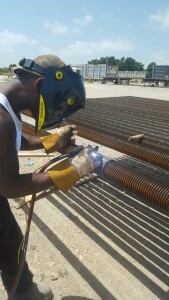 How long did it take you to get your first welding job after graduating? It took a while; I got a job with Cherokee Piping Services in June. The welding job market here in Tulsa has been pitiful. I had to take a job in Tahlequah, OK, which is 45 minutes away. Tell us what you do for them. I work shut downs for them. I’m off now for a couple of weeks. My next job should be down in Corpus Christi, Texas. The length of each job varies; usually no less than a month, no more than three. Some jobs we work five days in ten hour shifts, others might be 7/12s. You can get as much overtime as you want when you’re on a job, it just depends how much you want to work. What did you do with your first welding paycheck? Paid some bills! Man, I’ve got three kids 19, 16, and 12… and three grandkids too! Where do you want your welding career to go? Where would you like to be in three years? I’d like to have my own truck, be doing my own thing on the pipelines. I’d like to have a couple of welders working with me. That machine I just won from the school; that’s my start. Man, I could weld a ship with that; it’s an industrial strength machine! That was the first hump. Now I’ve got to save up my money and get my truck. Once I mount that machine and a generator in the back of it, I’m in business! Do you think you need to spend more time with Cherokee first to build experience? Yes, definitely. But in about three years I’ll be 40, and I’ll be real good with pipes by then! So that’s your dream job? Some welders talk about working pipe in Alaska or working on oil rigs. The reason why I want my own truck is so I don’t have to leave at somebody else’s beck and call. I’d like to be able to do a whole lot of work here in Oklahoma and the surrounding areas. I don’t really want to go to Alaska. For the amount of money they pay you to go to Alaska, I might consider it for four or five months, but I really don’t want to go that far from home. I don’t want to miss out on my kids or my grandkids by being away too much. I’ve missed enough time already. I’ve been in prison for 10 years. 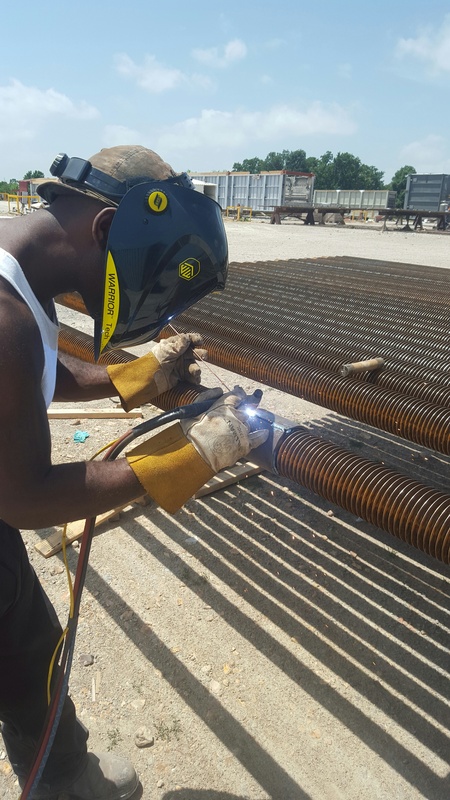 You mentioned prison again; do you think welding has helped you turn your life around? Yes, in a completely different direction. Going to welding school taught me a skill that I can use to feed my family, meaning I don’t have to commit crimes to get money. It’s a positive example that I can teach my sons, that they can teach their sons, and keep it on going down the line. I hope it’s something that won’t just make a difference in my life, but future generations – seriously. That I can take two or three pieces of metal, I cut them, fit them, clean them up, weld them together and now they’re one piece. That’s my favorite part right there – I’m building something. When the company knows that when you drop that hood, you’re going to get it done right. They don’t rush you. I like that I can work at my own pace. There’s a solitude to welding when you drop the hood. Did you make any lasting connections at school? Do you have your own little recruiting network? I’ve got some people that I keep in contact with, but everybody is pretty much working. We didn’t get to the point where we had to ask each other about jobs in this or that town, or this state or that. We all got jobs where we’re at. But, I know that once I get that truck and build my expertise, then they’ll be calling me with jobs. Are you doing piping? Are you doing fencing, because I need a couple acres of fence put up? Right now we’re not referring jobs to each other yet. I’d tell them that just because the hours are short, that doesn’t mean you don’t have to go in and do what you need to do. You’re only there five hours a day, there’s no time for slacking. If you start to slack you’re going to get left behind. You’ve got to be focused, pay attention, dedicate yourself to it, and keep your eyes open. There’s stuff in there that can hurt, even kill you, so you’ve got to be focused and careful. Some days it’s going to be hard. Some days you’re going to get mad because there’s a weld you can’t do. You see the instructor showing you how. You see classmates getting it, but you just can’t get it. Don’t get frustrated and quit. Don’t try to beat up a weld; it’ll come. There was a weld I couldn’t get, so I tried to force it and it ended up worse. So take your time, it’ll happen, but you have to stay dedicated. If you want something easy, you might as well not even come to Tulsa Welding School. It’s not easy. You’re going to be tired but don’t quit. Why would you quit something that could change your life? If you’re tired of this, you’re tired of trying to succeed, tired of trying to make progress. Some people quit because it was too hot. I mean, what did you think it was going to be? You’re melting metal! It’s going to be hot; you’re going to get burnt. It’s part of the job. New students need to understand that. Oh, and this is very important advice – they need to leave their phone in the car! What do you do for fun Wesley? I play on a softball team. I play basketball, I go fishing…but most of the time I take my sons to their basketball or football games. I’ve even got my grandson signed up for football; they’re my biggest hobby. If I knew I’d be back to work tomorrow, I’d probably take a couple of million dollars and invest in a whole lot of welding equipment. Enough to open a shop and have a couple of trucks. That would be fun!